Francis Xavier Campbell was born to Winfield Campbell and Emma Neville in Philadelphia, Pennsylvania, on April 23, 1916. 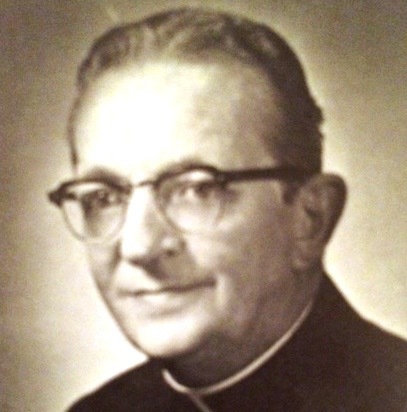 He attended Gesu Parochial School and graduated in 1934 from Roman Catholic High School. He entered the Maryknoll Society and studied philosophy at Maryknoll Apostolic College, Clarks Summit Pa., and theology at the Maryknoll Major Seminary in New York where he was ordained by Bishop James E. Walsh on June 10, 1945 for the archdiocese of Santa Fe, New Mexico. Father Campbell was assigned by his bishop to teach in the diocesan seminary of Santa Fe for the first five years of his ministry, then was assigned pastor at the Atomic Proving Ground at Los Alamos. In 1954, Father Campbell requested entrance into our Order, and professed first vows on September 10, 1955, and solemn vows on September 10, 1958. As an Augustinian he was assigned to various apostolates within the Province. He began in the teaching apostolate at Archbishop Carroll High School, Washington, D.C., and Villanova Prep, Ojai, California. He then moved into the parochial ministry at Saint Genevieve, Flourtown, Pa., Saint James, Carthage, New York, and Saint Paul, Mechanicville, N.Y. In 1981, he retired from active ministry to Our Mother of Good Counsel Monastery, Merrimack College, in North Andover, Massachusetts. Father Campbell was a quiet, reserved man, who brought a kindly presence to his ministry and to the communities to which he belonged. He died at the Merrimack monastery on October 13, 1984, and was buried in the Augustinian plot at Calvary Cemetery, West Conshohocken, Pennsylvania. Newer PostThomas B. Austin, O.S.A. Older Post James P. Curran, O.S.A.